Mundoro Capital Inc. (TSXV: MUN, www.mundoro.com) (“Mundoro” or the “Company”) is pleased to announce completion of the third year exploration program with Japan Oil, Gas and Metals National Corporation (“JOGMEC”), on the Borsko Jezero license (“Borsko”) located within the Timok Magmatic Complex (“Timok”) in eastern Serbia. 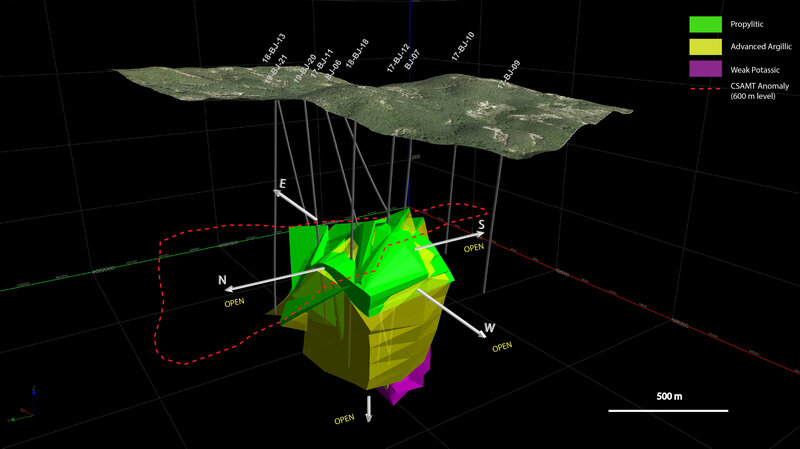 This exploration program is the third year of the Phase I earn-in with JOGMEC, which included primarily: (i) 57.6 line kilometers of Induced Polarization (“IP”) geophysics, (ii) a gravity survey over 6 sqkm and (iii) target testing drilling of 9,090 meters over 9 drill holes in Borsko. Borsko is one of the four licenses being sole funded by JOGMEC as part of the earn-in agreement entered into in 2016. Borsko is located directly west of the Bor copper porphyry underground mine and the Veliki Krivelj copper-gold porphyry open-pit mine, all located in the central portion of Timok. 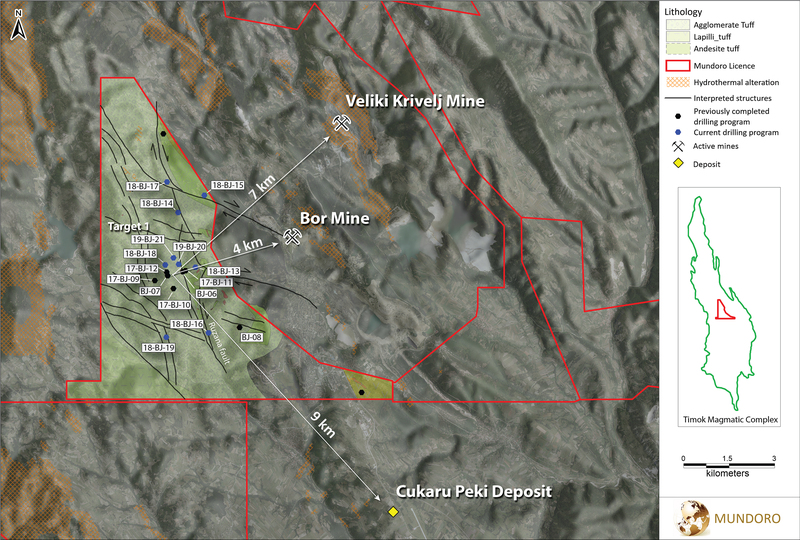 Timok is one of the most prolific metallogenic domains in the Tethyan Belt with deposits such as the Cukaru-Peki copper-gold deposit and the Bor copper porphyry underground mine and the Veliki Krivelj copper-gold porphyry open-pit mine (Figure 1: Borsko Location Map). There is an overall continuous geophysical CSAMT anomaly for at least 1.6 km in areal extent (Figure 2: 3D Alteration Model) which has been partially tested. Drilling to date has identified that this CSAMT anomaly appears to be related and delineates the advanced argillic alteration (“lithocap”) under cover. The drill tested hydrothermal alteration system extends 400 m by 800 m with a thickness 500+ meters. The alteration remains open primarily towards the north, west and south. Such alteration systems are host environments of the Bor and Cukaru-Peki high sulphidation Cu-Au deposits in the Timok region. At the bottom of the lithocap, weak potassic alteration was identified which suggests potential for porphyry style mineralization may be present beyond the immediate area drill tested to date. The uppermost 500 m – 800 m of Target 1 area is a weakly altered volcanic unit. At the bottom of this volcanic unit the transition zone appears with trace pyrite in chlorite-smectite and partially overprinted by kaolinite. It is in the top of the lithocap where marked concentrations of anomalous metal values occur suggesting that this is the likely location of high sulphidation mineralisation as exampled by Bor and Cukaru-Peki deposits which are located in this central region of Timok. The lithocap is approximately 400 m – 600+ m thickness of pervasive quartz-kaolinite-dickite alteration containing medium to strong semi-massive pyrite. Pyrophyllite and alunite are also present together with small bodies of vuggy residual quartz. These alteration assemblages confirm typical acid environment which host high sulphidation mineralization. In the deepest holes at ~1,200 m, the advanced argillic alteration transitions abruptly downwards to chlorite-bearing andesite, interspersed with patches containing remnant biotite of hydrothermal origin and minor epidote. This may be considered as weakly developed potassic alteration, suggesting that the porphyry intrusion that supplied the magmatic fluid for this alteration lies beyond the immediate area drill tested to date. Copper and gold values are elevated in many parts of the advanced argillic zones and the underlying chlorite-biotite zones. Elevated copper values are either present as energite (e.g. 17-BJ-07, 1033 m) or fine sulphides, but in the chlorite-biotite zone as chalcopyrite (e.g. 17-BJ-07, appears from 1250 m and 19-BJ-20 at 890 m). There is an overall a continuous geophysical CSAMT anomaly for at least 1.6 km in areal extent which has been partially tested. Drilling to date has identified that this CSAMT anomaly appears to be related and delineates the lithocap under cover. In the northwestern direction, drill hole 18-BJ-18 intersected advanced argillic alteration which is characterised and dominated by fine-grained silicification with strong disseminated pyrite and minor kaolinite. Towards the northeast, as indicated in hole 19-BJ-20, the advanced argillic alteration abruptly transitions to quartz-magnetite-biotite (weak potassic) alteration at 859 m containing trace chalcopyrite and a quartz-molybdenite vein. Westwards and Southwards, the alteration package remains open as the drill hole depths of holes BJ-09 (to the west) and BJ-10 (to the south) were unable to conclude if the alteration extends in these directions and as such, follow up deeper drilling is required to test for extension of the lithocap in these two directions. Eastwards, the advanced argillic alteration zone, appears to weaken to chlorite-smectite with pyrite as observed in 18-BJ-13. At depth, transition to weak potassic alteration containing weak quartz veining with trace chalcopyrite suggests potential for porphyry style mineralization in the vicinity. Approximately 2,000 meters to the south of Target 1, the South Target was tested which identified a heavily faulted zone of pyrite-bearing chlorite-smectite-kaolinite alteration for an interval of 184 m in drill hole 18-BJ-19, indicating a possible periphery of another Borsko-type lithocap. Located approximately 2,000 m to the north-northeast of Target 1, Target 5 was tested with three drill holes 18-BJ-14, 18-BJ-15 and 18-BJ-17 to test the west-northwest fault that runs through the area of Target 5 and appears to also be cutting through the vicinity of the Bor mine 4 km to the east. Trace of chalcocite and remnant of covellite and chalcopyrite mineralisation, as well as disseminated native copper were observed within the hornblende-feldspar andesite. For further description of the Borkso geology see Mundoro’s press release dated December 18, 2017 at www.mundoro.com. The drilling technique was triple tubed diamond drilling from surface for PQ and HQ, while for NQ was double tubed. The drill holes were generally cased from surface progressing from PQ to HQ at 380m on average, however exact depths vary from hole to hole. Drill hole orientations were surveyed at approximately 30 meters intervals. Drill core was oriented using the Reflex EZ-Trac and Devico Pee Wee tools, the bottom of the core was marked by the drillers and this was used for marking the whole drill core with reference lines. Company personnel monitored the drilling, with drill core delivered daily to the Company’s core storage facility where it was logged, cut and sampled. Core recovery was measured and recorded continuously from the top to the end of the hole for every drill hole. Each run of 3m length was marked by plastic core block which provided the depth drilled. Core recovery is recorded as 99.4-100% in most intervals. The drill core was sawn into two along drill core orientation line using a core-cutter and left half looking downhole was collected in bag and submitted for analysis, the other half is kept in tray and stored. Samples were collected at one or two-meter lengths from mineralised intervals and every fifteen meters one sample of two-meter lengths from non-mineralised intervals with brakes for major geological changes. The samples were submitted to SGS managed laboratory in Bor, Serbia for sample preparation and analysis. Drill core samples are assayed using 50-grams charge for fire assay with atomic absorption finish and multi-element method 4 acid digestion ICP-AES package IMS40B. In addition to the laboratory’s internal QA/QC procedures, the Company conducted its own QA/QC with the systematic inclusion of certified reference materials every 20 samples, blank samples every 20 samples and field duplicates at every 25 samples. This News Release contains forward-looking statements. Forward-looking statements can be identified by the use of forward-looking words such as “will”, “expect”, “intend”, “plan”, “estimate”, “anticipate”, “believe” or “continue” or similar words or the negative thereof, and include the following: completion of the earn-in expenditures and options by JOGMEC; and completion of a definitive joint venture agreement by the parties. The material assumptions that were applied in making the forward looking statements in this News Release include expectations as to the mineral potential of the Timok North Properties, the Company’s future strategy and business plan and execution of the Company’s existing plans. We caution readers of this News Release not to place undue reliance on forward looking statements contained in this News Release, as there can be no assurance that they will occur and they are subject to a number of uncertainties and other factors that could cause actual results to differ materially from those expressed or implied by such forward-looking statements. These factors include general economic and market conditions, exploration results, commodity prices, changes in law, regulatory processes, the status of Mundoro’s assets and financial condition, actions of competitors and the ability to implement business strategies and pursue business opportunities. The forward-looking statements contained in this News Release are expressly qualified in their entirety by this cautionary statement. The forward-looking statements included in this News Release are made as of the date of this News Release and the Board undertakes no obligation to publicly update such forward-looking statements, except as required by law. Shareholders are cautioned that all forward-looking statements involve risks and uncertainties and for a more detailed discussion of such risks and other factors that could cause actual results to differ materially from those expressed or implied by such forward-looking statements, refer to the Company’s filings with the Canadian securities regulators available on www.sedar.com.